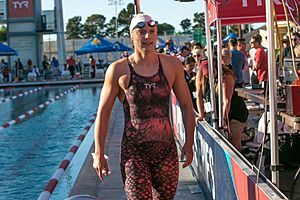 Kathleen Genevieve Ledecky (born March 17, 1997) is an American competitive swimmer. She has won five Olympic gold medals and 14 world championship gold medals, the most in history for a female swimmer. She is the current world record holder in the women's 400-, 800-, and 1500-meter freestyle (long course). 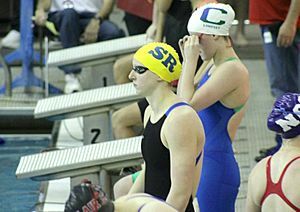 She also holds the fastest-ever times in the women's 500-, 1000-, and 1650-yard freestyle events. Ledecky's success has earned her Swimming World Female World Swimmer of the Year a record-breaking five times. Ledecky was also named Associated Press Female Athlete of the Year in 2017, international female Champion of Champions by L'Équipe in 2014 and 2017, United States Olympic Committee Female Athlete of the Year in 2013, 2016 and 2017, and Sportswoman of the Year by the Women's Sports Foundation in 2017. Ledecky's 10 individual gold medals at the World Aquatics Championships and 14 combined individual titles at the Olympics and World Aquatics Championships are records in women's swimming. Ledecky was born in Washington, D.C., the daughter of Mary Gen (Hagan) and David Ledecky. Her paternal grandfather, Jaromír Ledecký, was Czech, and came to the United States from Czechoslovakia in 1947. Her uncle is businessman and New York Islanders owner Jon Ledecky. Ledecky is a Catholic and often prays the Hail Mary before a race. During the summer of 2012, she trained with the Nation's Capital Swim Club under coach Yuri Suguiyama. Following Suguiyama's departure to coach for the University of California, Berkeley, she continued to train with the Nation's Capital Swim Club under coach Bruce Gemmell through the 2016 Olympics. During the summers prior to 2012, she swam for Palisades Swim Team in Cabin John, Maryland. 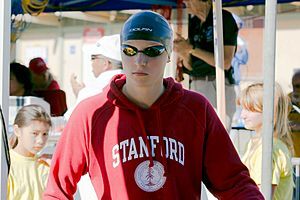 Ledecky accepted an athletic scholarship to Stanford University, where she swims for coach Greg Meehan's Stanford Cardinal women's swimming team. Katie Ledecky Facts for Kids. Kiddle Encyclopedia.